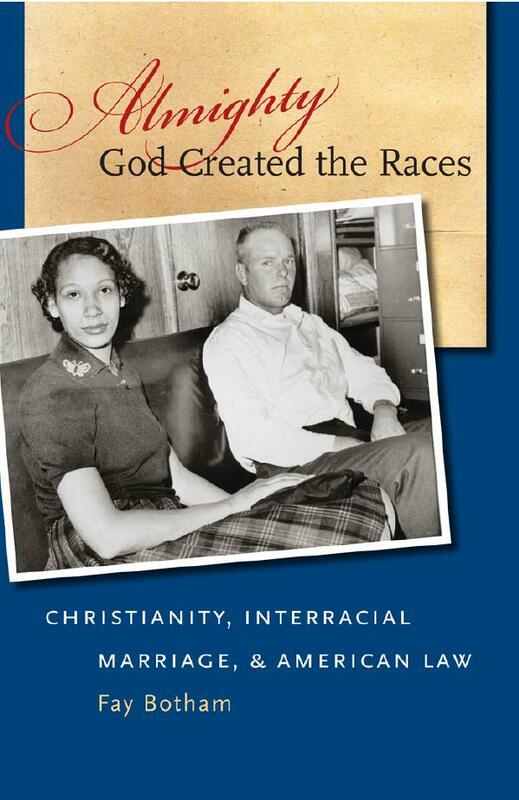 This February, the University of North Carolina Press will publish a paperback edition of Almighty God Created the Races: Christianity, Interracial Marriage, and American Law by Fay Botham (visiting assistant professor at Hobart and William and Smith Colleges). The publisher’s description follows. In this fascinating cultural history of interracial marriage and its legal regulation in the United States, Fay Botham argues that religion–specifically, Protestant and Catholic beliefs about marriage and race–had a significant effect on legal decisions concerning miscegenation and marriage in the century following the Civil War. She contends that the white southern Protestant notion that God “dispersed” the races and the American Catholic emphasis on human unity and common origins point to ways that religion influenced the course of litigation and illuminate the religious bases for Christian racist and antiracist movements.